Easily mixed and with a delicious strawberry flavour, USN's Pure Protein provides an excellent source of protein which the body can use to build and maintain muscle tissue during and after intense physical activity. This scientifically engineered formula is a must for any athlete, body-builder or individual. Its protein blend consists of a precise mixture of different protein sources. Protein is the structural core of the human body and is at work in every single cell. Protein performs many essential functions in the body, and is required for growth and repair of tissues. 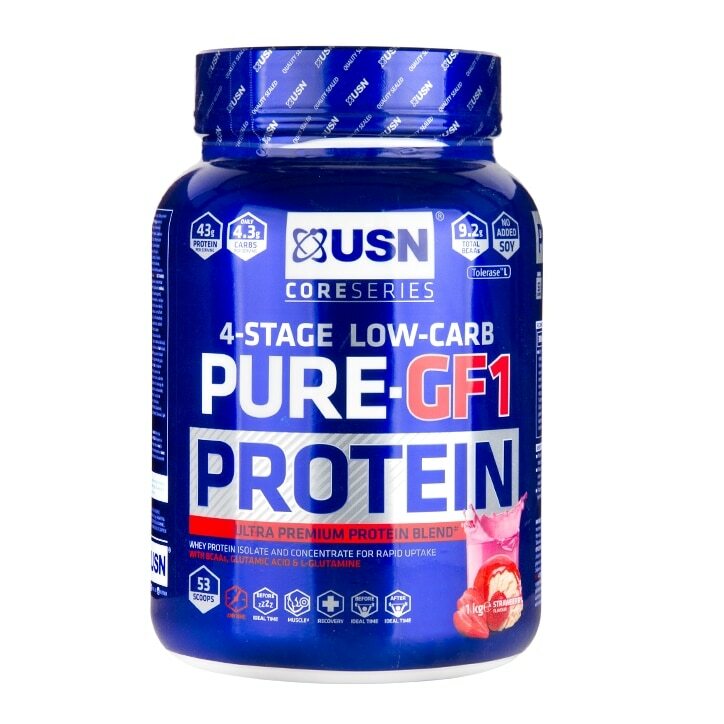 USN Pure Protein GF-1 also contains Pantothenic acid, which supports normal synthesis and metabolism of steroid hormones, Vitamin D and some neurotransmitters. Pantothenic acid also contributes to normal mental performance and a reduction in tiredness and fatigue. Add two heaped scoops to 300 - 350ml of cold water in a hand held shaker and shake for 30 seconds. Allow to settle for around 45 seconds before drinking. Have 2-3 servings daily. Servings may be halved. Contains cow’s milk, soy & egg protein. Ingredients may contain traces of tree nuts, peanuts and crustaceans. USN Pure Protein Strawberry is rated 4.7 out of 5 by 6. Rated 4 out of 5 by Laraaa from Love it Really good protein will buying again , I recommend. Rated 5 out of 5 by Hannah80 from Excellent product! Really like this product. Is great blended with frozen berries or on its own. A tasty shake to have anytime of the day. Can't fault it.